Currently, the students have been in Guatemala for 5 days and have already experienced a lot. Upon their arrival they were given local currency and were able to explore the community and its local shops. They were able to hike the scenic view of Antigua and the surrounding volcanoes, and discover the beauty of this new country. Although they were able to enjoy the beautiful country, the students also started to learn more about the country and the people who live there. They talked to locals about their community and and were sent off to the local Antigua market for a scavenger hunt to purchase supplies that might be needed for survival in the mountains! 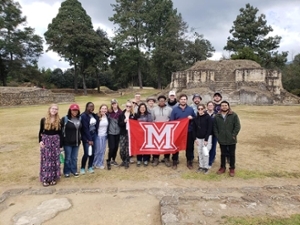 After their time in Antigua, the students traveled to the city of Nejab. They toured Mayan ruins and were able to learn more about the Mayan culture. Here they were introduced to their host families for the remainder of the trip. Most recently, the group hiked to La Pista and learned more about this community and eat a traditional Mayan meal. They are starting to learn about the projects they will be completing for the rest of their time abroad, to develop solutions that can help treat some of the community problems. We cannot wait to see what the students complete during the rest of their study abroad. If you are interested in learning more about the study abroad and seeing more pictures visit the CEC Facebook page.